From the first moments our twins arrived to this world, 18 minutes apart, their instinct was to nurse, to nourish their selves and seek comfort with their mother who had carried them to term. 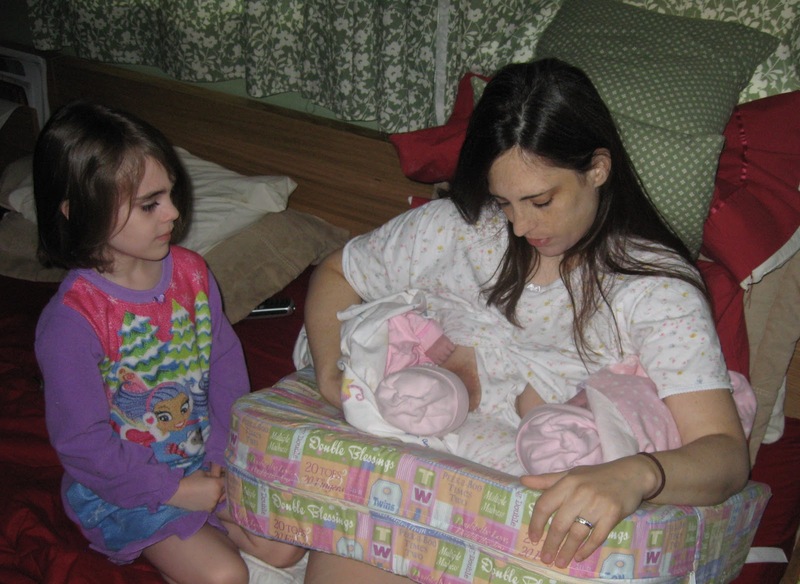 I had breast-fed our three older daughters and briefly tandem nursed with Lana and Madelyn, who had just turned two when her sister was born a week later. But, I had not anticipated the feeding demand of twin babies. I eased into it, nursing them together more often than apart. My hunger seemed insatiable and I continued to eat the protein bars that I had used to supplement my diet during my pregnancy so the twins would gain birth weight. I also drank tons of water and Mother's Milk Tea to help with my milk supply. As with each baby before, we found our routine and settled into it. What worked for us? Determination, nursing on demand, designating sides to each twin, co-sleeping so I was able to roll to whichever baby woke and nurse them back to sleep with ease and almost no sleepless nights for myself or the other family members. As with the older girls, the process of weaning was always the same. I was more ready than they were, usually due to a new pregnancy and the irritation that the early months of sickness and exhaustion delivered. The nursing times were usually held to short sessions at nap and bedtime. With the twins, they nursed as a way to get undivided attention alone with me as well. In my early weeks of this new pregnancy, I had to stay on my feet often to avoid Isabella and Grace's desire to crawl into my lap to nurse. When I did hold or sit with them, they would always pat me for milk. I would explain that they were growing into big girls and did not need to drink milk any more. I constantly reassured them that I loved to be with them and that I was glad to have them near me, even when they were not nursing. There was resistance at first. There were tears and frustration. There was giving in on days when I was too tired to stay on my feet and we would snuggle under a blanket to nurse and take a nap. Then one day in August, neither twin asked for milk. It was the day that I had been easing them into for weeks on end, and when it arrived I had mixed emotions. On one hand, I was sad to know my 27 months of nursing twins was over. On the other, I was glad Isabella and Grace had come to mutual terms with this next step in their lives. "Time stops around us for a moment, scenes held in a snowy globe. Hold back! Stop! I panic, unprepared for change, but it's too late. She sweeps on in her life. I cannot gather back one moment, only marvel at what comes next." They did nurse a couple times after that fateful date but briefly and usually due to the overwhelming draw of sleep. They will fall asleep now with their Daddy in the rocking chair or by curling up next to their sisters who welcome them under a blanket before bedtime. Most nights, their night routine is spent with me in our bed before they are placed in their own room. On a rare occasion, one or the other will pat my breast and look up at me to question, "Mil-milk"? I reply, "Yes, my sweet, that was your milk." And content enough with that answer, they close their blue eyes and drift off to dream. How very bitter sweet, these precious moments of achievement. I remember all too well. The feeling of wanting to be done, knowing they are ready, are old enough. Then the final nursing comes and wondering if it was rushed, if perhaps it was in haste. Then coming to the conclusion that it is just another bitter sweet step in independence. Thanks for sharing this wonderful post. Brings me back.